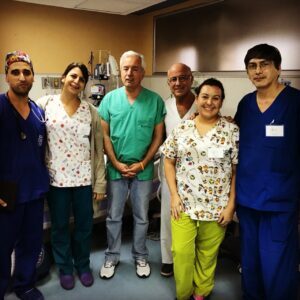 Novick Cardiac Alliance worked at Hospital del Nino’s Dr. Francisco Ycaza Bustamante in Guayaquil, Ecuador April 28 – May 12, 2018. This was the first time our team returned to Hospital del Nino since 2014. 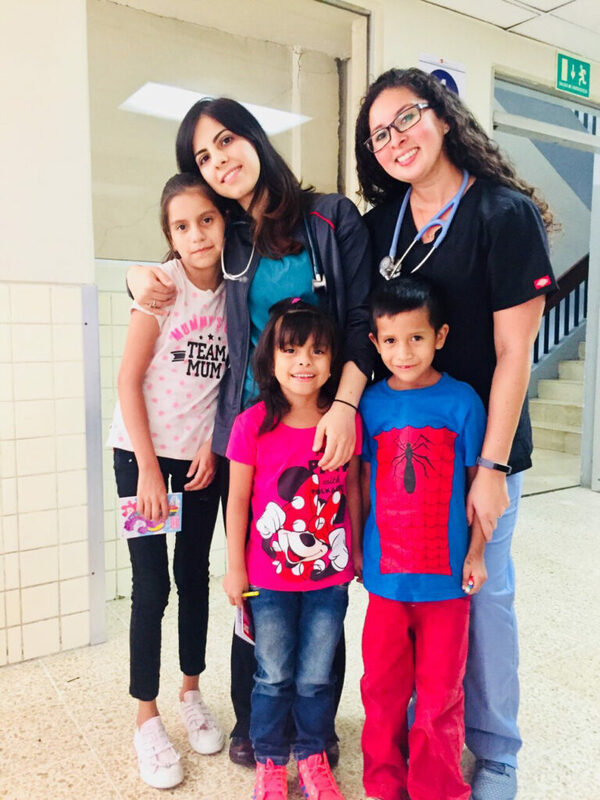 This trip was made possible by the generous donations from our partners “With Every Heartbeat, the Fialeny Foundation” and support from Ecuadorian charity “Fundacion El Cielo Para Los Ninos.” Our team consisted of 17 medical volunteers from 12 different centers in the USA and Argentina. 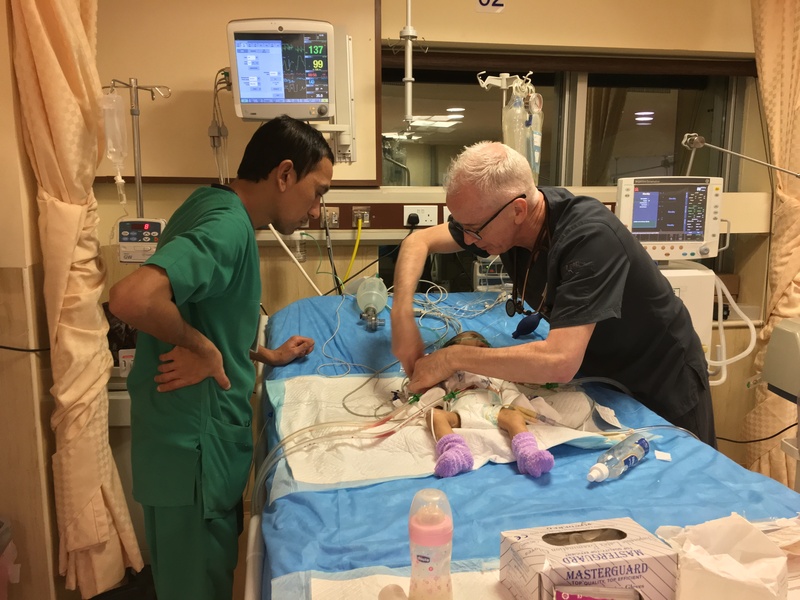 Over the two week trip, NCA Cardiologist Dr Mark Gellat evaluated nearly 70 children, performing echocardiograms and assessing these children for heart defects. 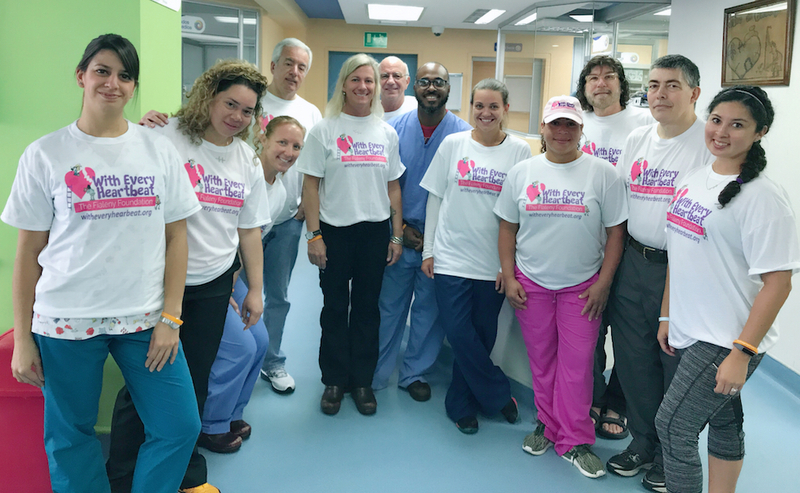 Led by NCA pediatric heart surgeon Dr Marcelo Cardarelli, fifteen children received life-saving heart surgery in 8 days of operation. We were pleased to discover that the local team in Guayaquil had been continuing their education and teaching new staff skills to become more competent in pediatric cardiac care and surgery. 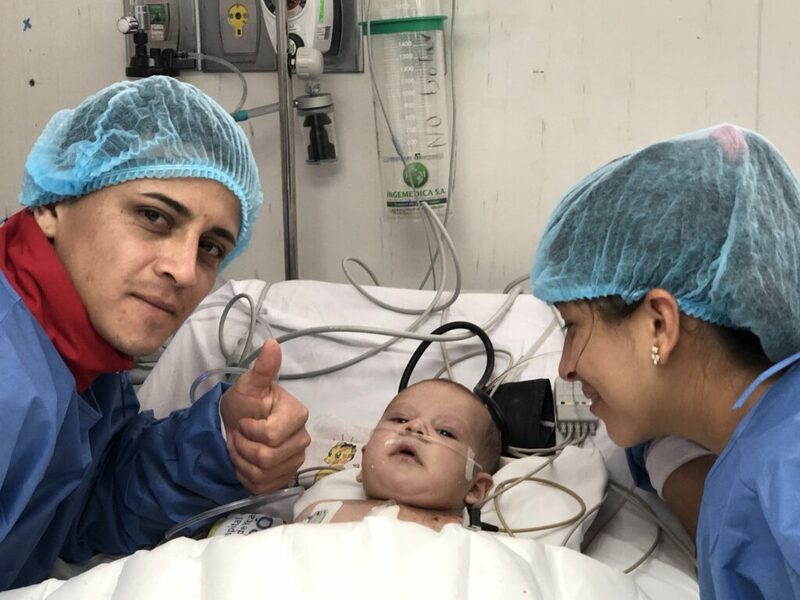 The local surgeon Dr Hernan Montero has been operating in the absence of visiting teams and the ICU has been led by Venezuelan Intensivist Ricardo Briceno. Each morning during patient rounds, Dr Briceno quizzes nurses and new doctors about a specific defect or complication in order to expand their critical thinking skills. The ICU team was led by PICU nurse educators Farzana Shah and Roslyn Rivera. 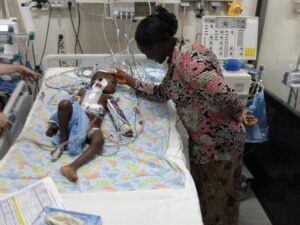 Our ICU physicians and nurses provided 24 hour care for these children before and after surgery the entire two weeks. Many of the children were discharged from the hospital within 48 hours of surgery. The majority of the children we operated during this trip were between 5-12 years old, with simple heart defects that require surgery in order for them to survive into adulthood. These children have been on a waiting list for surgery for several years, but there are not enough surgeons in Ecuador to provide surgery. The babies born with more complex heart defects are often not as lucky. Complex heart defects require early intervention for babies to survive to age one. 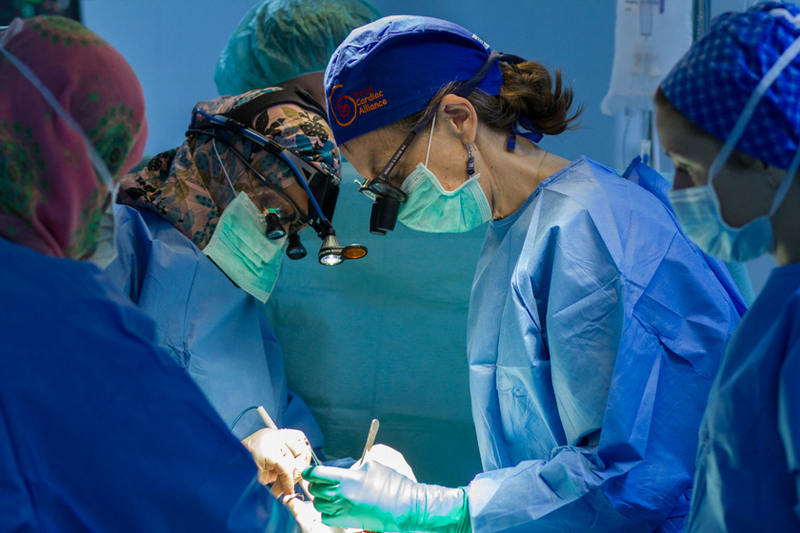 Our trip to Guayaquil helped enhance the medical skills of the surgeons, doctors, and nurses so they can continue to provide treatment for children with heart disease in their country. Milan is a baby with a complex heart defect that requires immediate surgery to survive. For four months, Milan’s mother watched her baby turned dark blue whenever he would cry. Several times, she took him to the doctor in the village where they live, but the doctor would say that Milan would “grow out of it.” Searching for answers, Milan’s family brought him to the pay-clinic in Guayaquil. There the doctors told her he had a serious problem with his heart and he needed to see the cardiologist at the Bustamante Children’s Hospital. As if by fate, the next day, NCA cardiologist Dr Gellat saw Milan. Just from seeing his blue pale appearance, Dr Gellat knew immediately that Milan did indeed have a complex heart defect. The echocardiogram showed that Milan had pulmonary atresia, meaning blood was not flowing the normal way into his lungs to receive oxygen. His blue color was from severe lack of oxygenated blood. Our team discussed a plan and Milan received surgery to create a pathway for blood to flow to his lungs. Milan had a difficult recovery after his surgery, but was doing very well when our team left the country. We have received updates from Milan’s parents that is now home and happily growing. His parents were immensely happy to see their baby boy finally looking well. It’s babies like Milan that remind us how desperately advanced pediatric cardiac care is needed in developing countries. 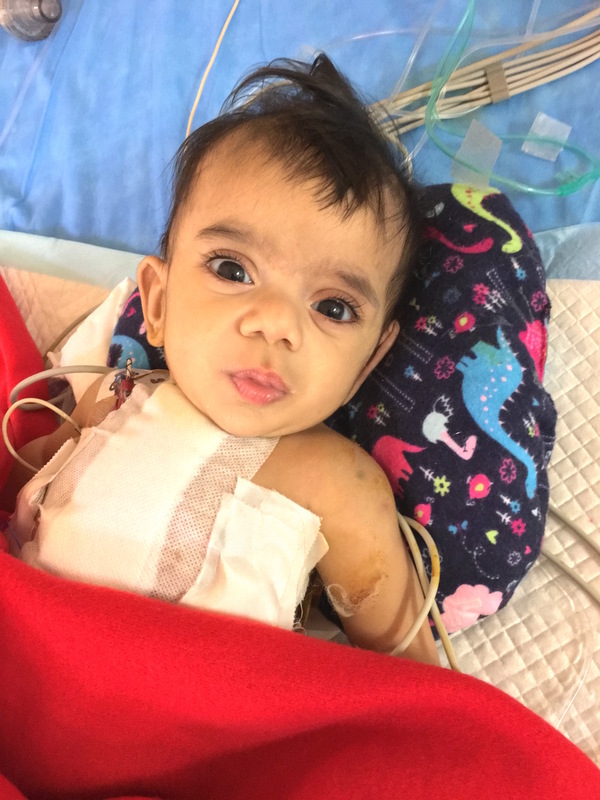 Our teams strive to educate local teams about pediatric cardiology so that babies like Milan can be properly diagnosed and treated early, and given a chance to survive. 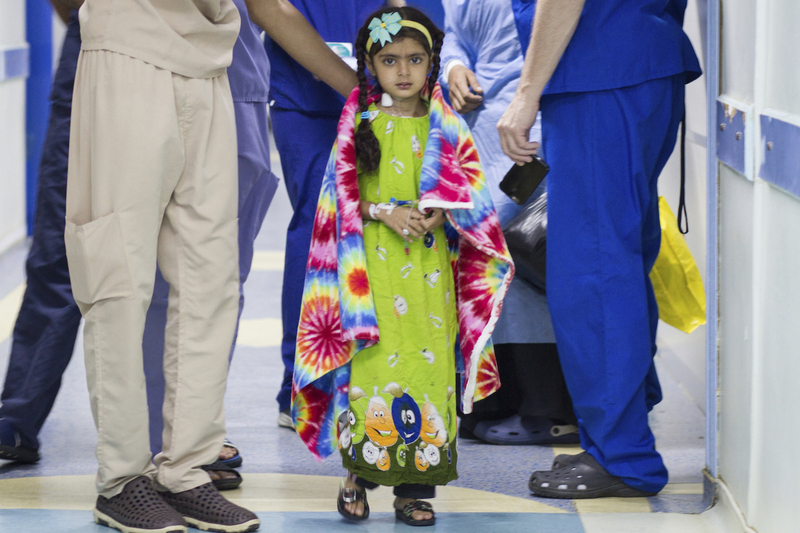 9 year old Narges was born in Iraq with a severe heart defect. When Narges was an infant, her mother noticed she would become blue when eating or crying. She took her to several doctors throughout Iraq, but nobody could give them any answers. 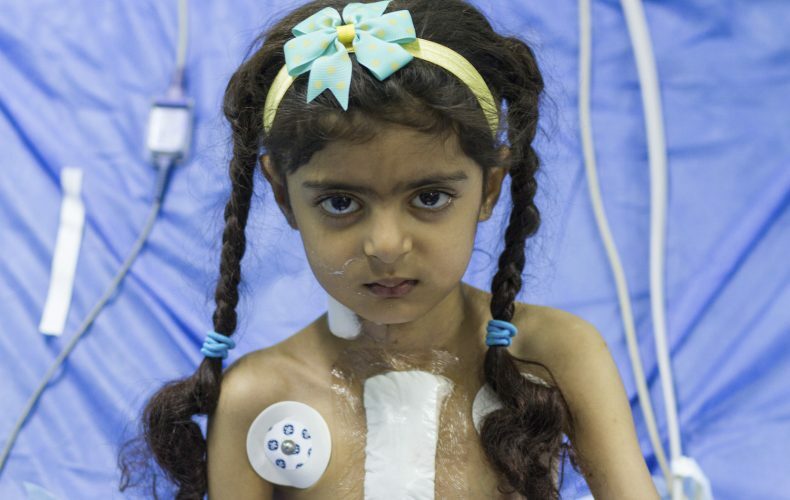 Finally a doctor told them that Narges had a heart defect, but nothing could be done in Iraq to help her. They were encouraged to find help outside the country. At one year of age, Narges’ parents used all their money to take her to India for medical treatment. Here she was finally given a proper diagnosis. She was born with a complex heart defect, single ventricle with mitral atresia. Even in India, Narges was deemed inoperable. For years, her family watched their beautiful daughter remain blue and ill, which progressively worsened over the years. 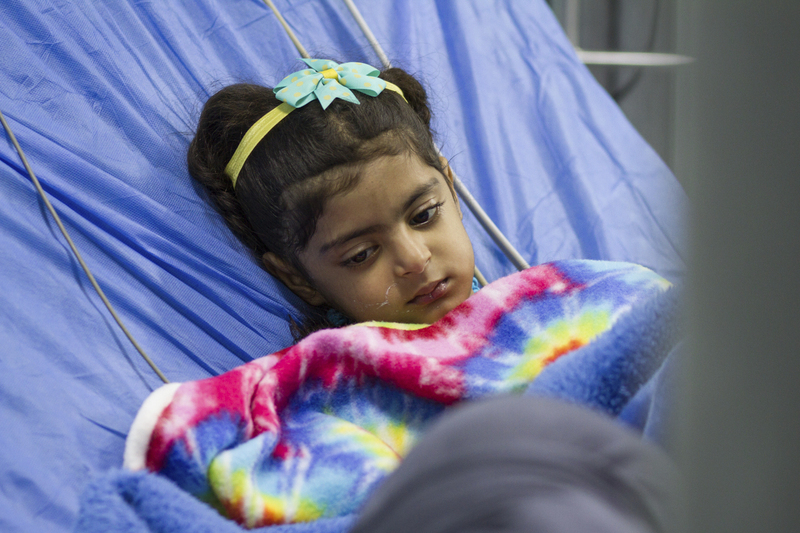 Narges’ parents took her to several hospitals in Iraq, hoping that someone could help their daughter. Through the strife of war in their country, Narges’ mother never lost hope. She persevered in her search for a heart surgeon that would take her daughter’s case. Finally, she saw an advertisement from Al-Amal Hospital in Nasiriyah Iraq that announced the arrival of an International pediatric cardiac team that was offering heart surgeries. Dr Novick met Narges in clinic at Al-Amal Hospital in October 2017. At that time, Narges’ blood oxygen levels were only 70%. Her heart was severely enlarged and the improper circulation of blood inside her heart had been causing lung damage for years. Dr Novick prescribed medication to help lessen some of the damage and requested that Narges return to the hospital for evaluation when our team returned the following month. 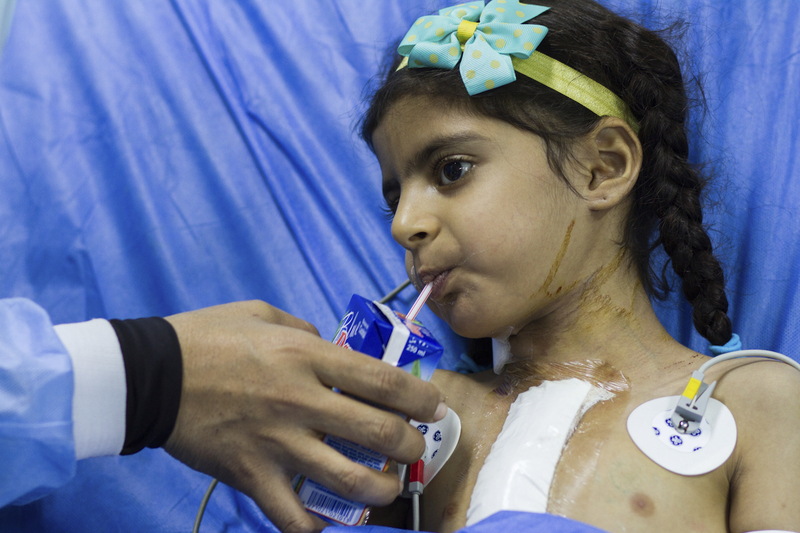 In November, Narges and her family returned to Al-Amal Hospital to met with our team. Narges’ heart was still severely enlarged and her only option was a palliative surgery that would prevent further lung damage. The hope was that this surgery would improve her quality of life. Dr Humberto Rodriguez performed this surgery and Narges recovered quickly in the ICU. Our team was impressed by her determination, asking to get out of bed the day after her surgery. She wanted to get cleaned up and loved having her hair brushed and braided by nurse Emily. We witnessed the fight inside this young girl, and we understood where she gained her strength from, her mother. Narges’ mother emotionally described how difficult it was to watch her daughter struggle to breathe, and how she fought to find proper treatment. Both of her parents really understood the severity of their Narges’ heart disease. They were so thankful to our team for offering her this chance to simply have more time in life. Sometimes, we cannot completely repair a child’s heart, especially those children who have lived for many years with complex defects. This is why we aim to educate cardiologists and pediatricians to diagnose and plan treatment for these children when they are young. For now, Narges will continue to go to school and spend time with her family. This gift of time is what matters most to the families who are barely grasping at hope. 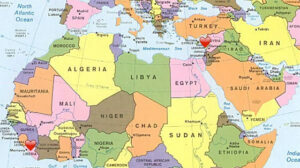 In August 2010, before the end of the Iraq War, Dr. Novick and his teams began traveling to Iraq. We believed that Dr. Novick’s vision to provide cardiac care and surgery to children suffering from heart disease was more important than politics, religion or where these children were born. Over the course of the past 8 years, we have worked in 6 hospitals located in 5 different cities throughout Iraq. In December 2017, we celebrated performing our 1,000th pediatric heart surgery in Iraq. 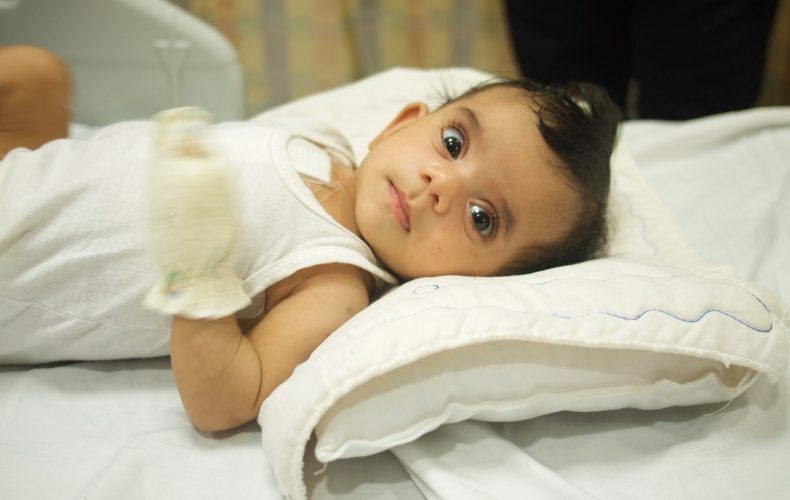 Mohammed was only 17 days old when he received his life-saving heart surgery from our team in Karbala, Iraq. He was born with Transposition of the Great Arteries and without surgery, the chances of him surviving to be one year of age was slim. 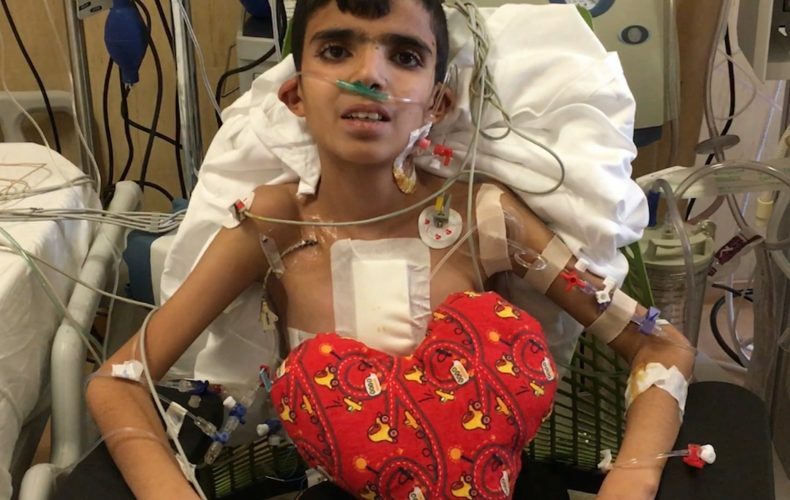 Weighing just 3 kilograms, Mohammed’s heart was only the size of a strawberry. 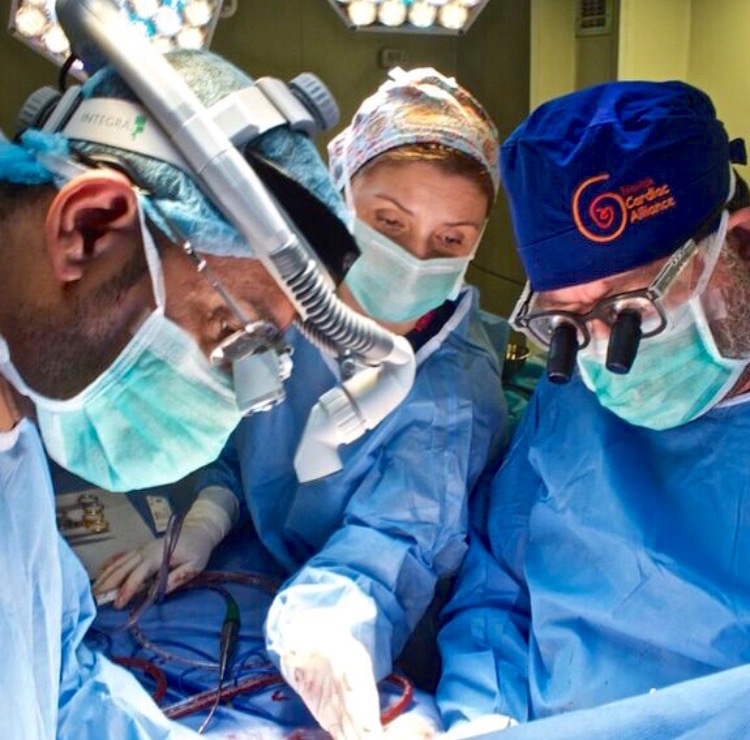 Cardiac Alliance surgeon, Dr Marcello Cardarelli and Iraqi surgeon Dr Ahmed Ebra worked together to perform this delicate surgery. Mohammed recovered over the course of two weeks in the ICU and is now home with his parents just outside of Karbala. Mohammed may be the 1,000 child, but there are still thousands more children waiting for heart surgery in Iraq. Since 2010, we have expanded our programs across the country of Iraq, beginning in the north in Sulaymaniyah to the spiritual capitol of Najaf. In the south, we began pediatric cardiac programs in Basra and at two centers in Nasiriyah. Our program in Karbala, located in central Iraq, has flourished with a fast-learning Iraqi pediatric cardiac surgeon. It’s through our collaboration with these 5 centers in Iraq that we have been able to provide life-saving heart surgery for over 1,000 children in Iraq. 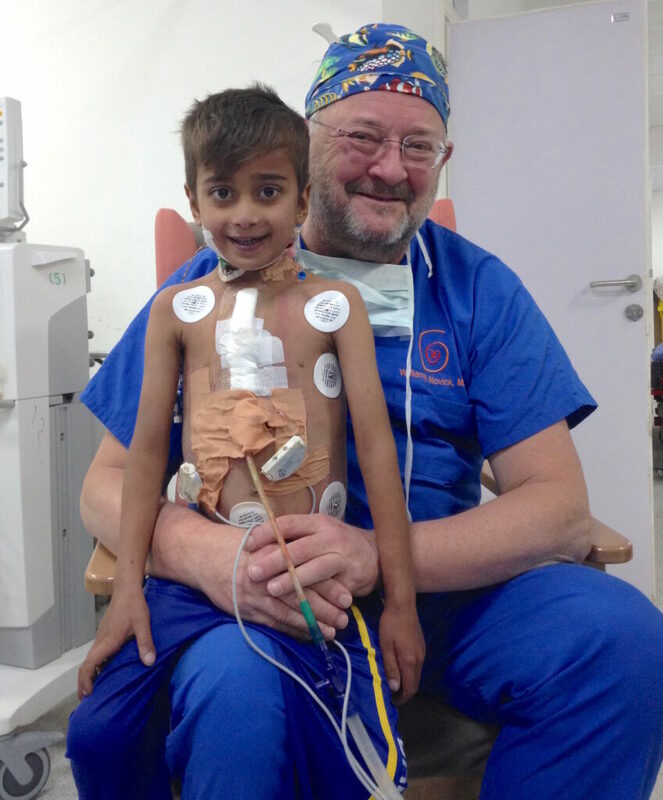 Novick Cardiac Alliance is the only organization providing pediatric heart surgeries in Iraq. We strive to fulfill the ever-growing list of children who require surgery to survive. Without our volunteers and supporters, we could not achieve this. Thank you for you continued support. There are thousands of children with undiagnosed heart defects waiting for someone to find them to save their lives. 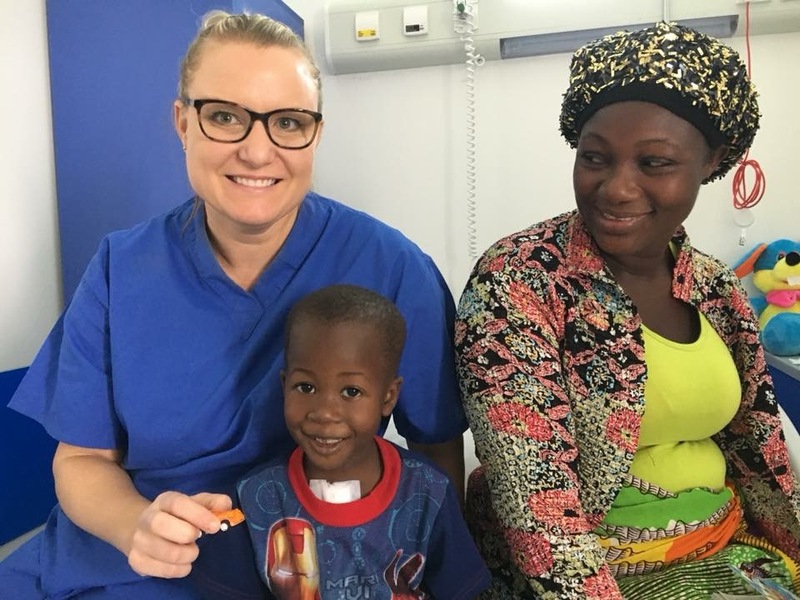 On our inaugural trip to Lebanon, Cardiac Alliance met a child who traveled from West Africa to southern Lebanon in search of a definite diagnosis and hopefully life-saving surgery. How was is that four-year-old Emmanuel, or E-man as his village calls him, who was so sick that he would sleep most of the day, could possibly travel across the entire continent of Africa?! This is a story of perseverance that emphasizes each person’s ability to help a child in need, even when the task seems dauntingly impossible. Emmanuel was born in July 2013 in the small village of Garplay, Liberia. 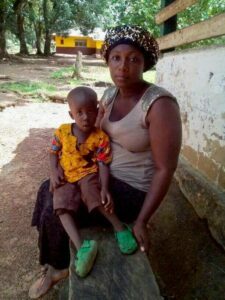 His mother Kuku describes his inability to eat as an infant, needing to take breaks to breathe rapidly and he didn’t walk until age two. His family was finally able to travel to Monrovia, the capitol of Liberia to find a specialist. 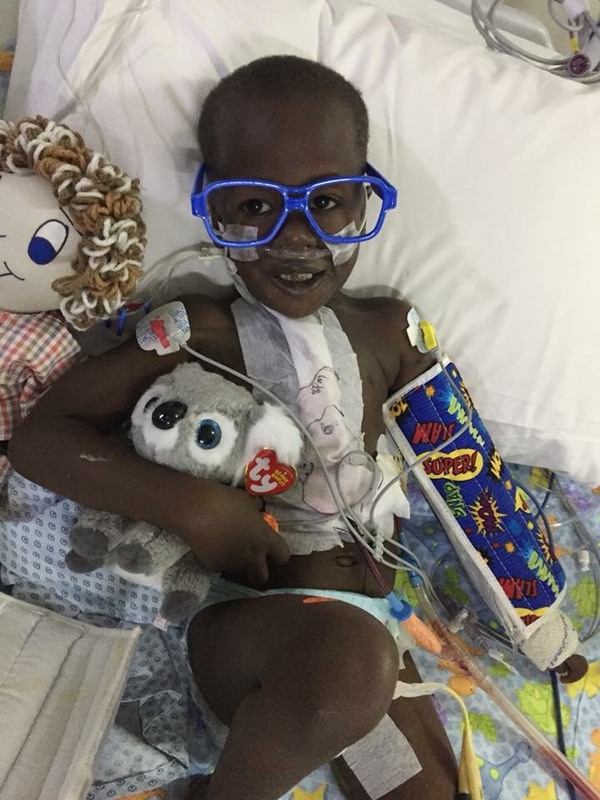 Emmanuel was presumed to have hole in his heart, though there is no an echocardiogram machine anywhere in the country to actually check his heart. His symptoms of extreme difficulty breathing, keeping his oxygen levels high enough, and playing with his 4 siblings were tell-tale signs. He would often pass out for hours at a time while his family would gather around and pray over him until he came to. This is where Emily and Brian from Florida, USA enter the picture. 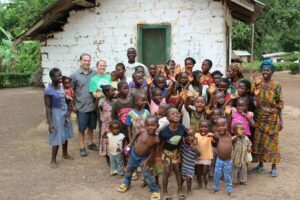 Emily and Brian work on the child sponsorship team for Light Evangelism Ministry and traveled to Liberia in March 2017. Emily describes meeting E-man for the first time, as “..heartbreaking. He was laying on a bench, gasping for air, and whimpering. His lips were blue. He didn’t even have the energy to sit up.” Emily and her organization committed right then and there to exhaust all efforts to get surgery for E-man. They made dozens of phone calls, just stabbing in the dark, trying to find a hospital in America that would work pro bono to save this child. After months of trying, they finally found a hospital in Florida willing to do the surgery, but were quickly devastated when the American Embassy in Liberia told us they would not grant a medical visa for any reason. Back to square one. After putting out a general plea on Facebook, one of Emily’s friends connected her with Elizabeth Novick, a founder of Novick Cardiac Alliance and wife of Dr. Bill Novick. Dr Novick accepted to repair E-man’s heart, as long as they could get him to any of the locations where Novick Cardiac Alliance was working. The first available country was Libya, but within days of travel, the visa fell through. Ukraine was next. But their hopes were quickly dashed as they found out E-man and Kuku would have to fly to Senegal to get a visa for Ukraine. The extra travel would be impossible for E-man in his condition and the money for the extra flights was more than anyone could afford. After some research, Emily discovered that Lebanon had an embassy in Monrovia, Liberia’s capital city! Now, just three weeks before Cardiac Alliance was scheduled to be in Lebanon, Emily and her organization were pressed for time to raise the money to fly E-man across the continent. On October 11, Kuku called Emily. E-man had had a horrible couple of days. He wasn’t eating. He was sleeping a lot and was not able to get off the floor. He was so very sick. Again Emily took to Facebook and posted a video explaining the call she’d just received. The money started to pour in, and in just one day, raised more than the amount they needed! They were fully funded, and E-man would have his surgery! One more hurdle. The Visas. Emmanuel and Kuku went to the Embassy and were told the man who wrote the letter from the Lebanese hospital would have to call the Embassy to confirm the validity of the case. 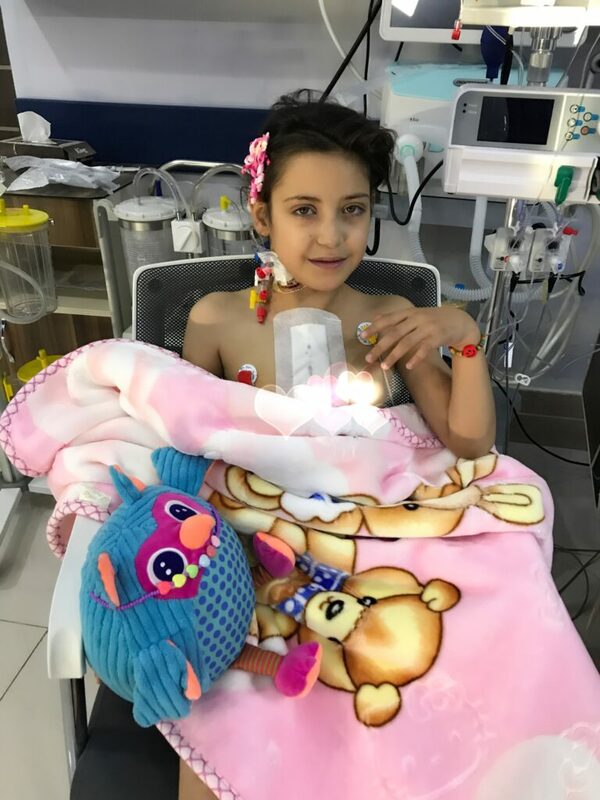 From America, Emily called Rashaya Governmental Hospital and was connected with the hospital medical director Dr. Yasser Ammar. Dr. Ammar called the Embassy, and E-man and Kuku were immediately granted their visas… just 5 minutes before the Embassy was closing for the day! No more hurdles. No more mountains. E-man’s surgery was on its way. Emmanuel arrived at Rashaya Governmental Hospital in southern Lebanon on October 23, and our team performed an echocardiogram and officially diagnosed E-man with tetralogy of fallot. This diagnosis explained why E-man would often squat when playing with his siblings, his body’s attempt to get more oxygen. His surgery was scheduled immediately. 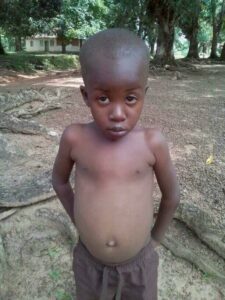 On October 25, Emmanuel received his healing surgery and we know he has a beautiful future ahead of him. It is people as determined as Emily that can help us save these children. This story brings us encouragement that individual people in the world have the power to bring awareness and treatment for the number one birth defect, congenital heart defects. We all have hopes that E-man will provide great change in his home country of Liberia one day! Artur is was born a fighter. Artur was born on the 1st of September in Luhansk, the easternmost city of Ukraine. Luhansk has been under the control of the separatist rebel group since 2014, and is known as “Luhansk People’s Republic.” This city was nearly destroyed by the war in 2014 and many public services are difficult to obtain, including quality care at hospitals. When Artur was 5 days old, his mother noticed he was breathing very fast and turning blue. She took him to the hospital in Luhansk but the doctors were unable to give a definite diagnosis and sent him home. Weeks continued and Artur’s mother became more concerned with her baby’s blue color. Again she went to the hospital and after several tests, the doctor thought he noticed something wrong with Artur’s heart. Finally the doctor in Luhansk called the Kharkiv Cardiac Center. This doctor sent a photo of Artur’s chest x-ray to Kharkiv pediatric cardiac surgeon Olga Buchevna and she recommended Artur be transferred immediately to Kharkiv. 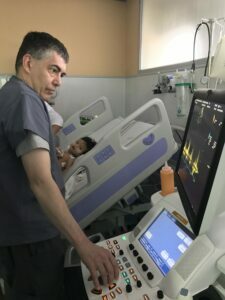 Upon his arrival at the hospital in Kharkiv, cardiologist Daria Kulikova performed a echocardiogram and diagnosed Artur with Transposition of the Great Arteries, plus a tiny ASD and tiny VSD. 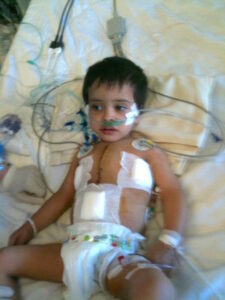 This heart defect usually must be repaired within two weeks of age, and Artur’s was very severe. He was not getting enough blood to his body or brain, with oxygen saturation levels barely 50%. His surgery would be complicated. Luckily our team arrived three days later and on October 9th, Artur received his life saving heart surgery. 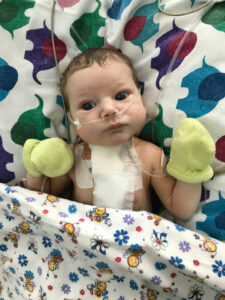 Kharkiv pediatric cardiac surgeon, Olga Buchevna, performed this surgery flawlessly with assistance from Cardiac Alliance surgeon Kathleen Fenton. Artur recovered quickly in the ICU and was drinking milk two days after surgery. His serious facial expressions proved to us that this little boy has a strong will to survive. 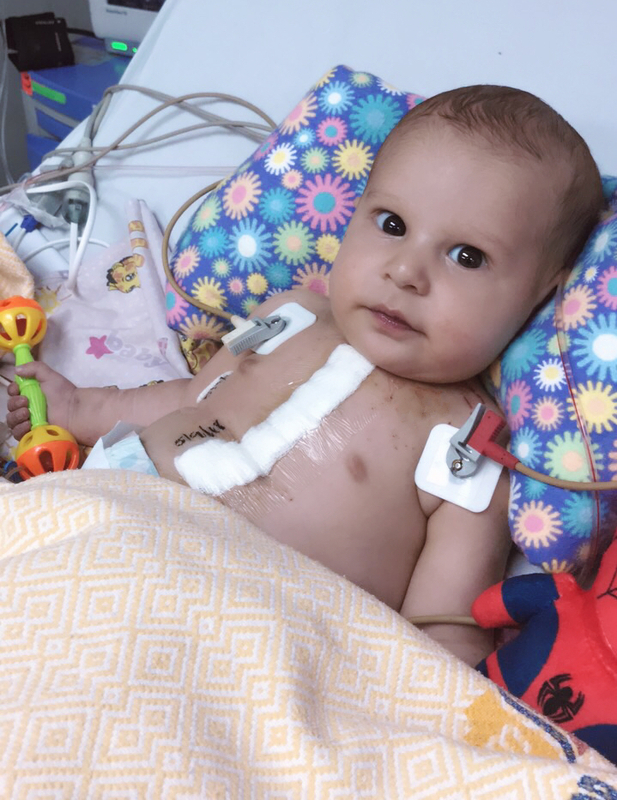 There are babies like Artur around the globe, fighting for their lives, waiting for medical assistance to mend their heart defects before it’s too late. 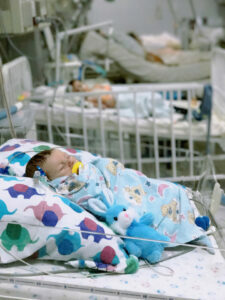 Two brothers, Four heart defects. 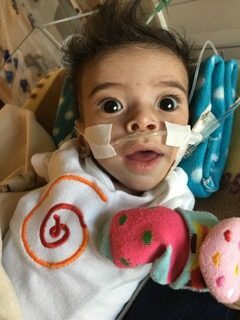 In 2012, we met Abdul, a Libyan boy who was born with four heart defects, called Tetralogy of Fallot. Dr Kathleen Fenton operated on Abdul alongside Libyan pediatric cardiac surgeon Dr Wejdan Abou Amer. Because his heart defects were diagnosed late, Abdul was very sick following his surgery and remained in the ICU for many days. Our team was scheduled to leave the country, but Dr Fenton changed her flight to stay and help the Libyan team care for Abdul. In June, our team returned to Benghazi and met Abdul’s little brother Mohammed. 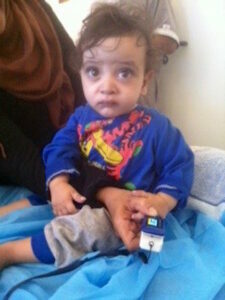 Mohammed has also been diagnosed with Tetralogy of Fallot. His parents were devastated to learn their second son also had a life threatening heart defect. It is “life threatening” because he lives in war-torn Libya with limited basic health care available, let alone pediatric heart surgery. Since our team has been visiting Libya and educating the local Libyan medical professionals for several years, we are witnessing the magic our work accomplishes. Mohammed needs a type of surgical procedure that the local Libyan surgeon Dr Wejdan can now perform on her own! 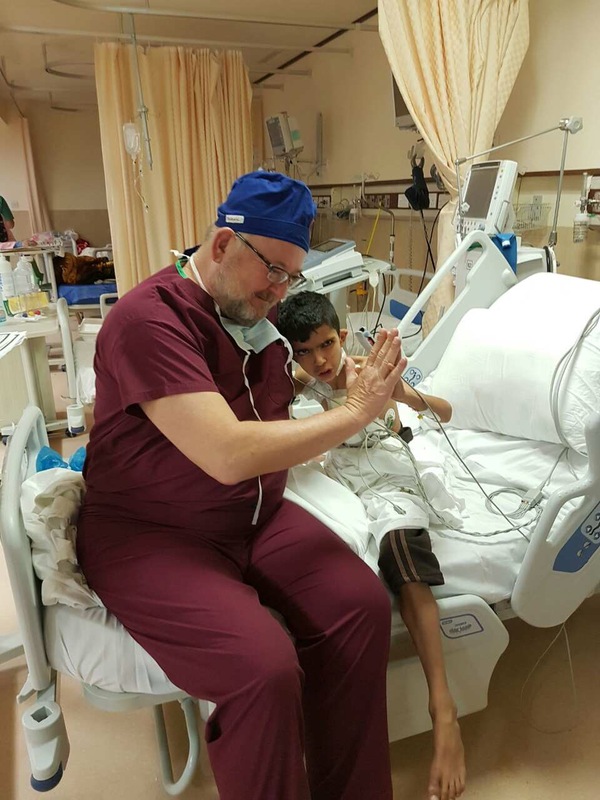 Dr Fenton collaborated with the Libyan team and determined that Mohammed’s surgery can be performed by Dr Wejdan after our team leaves the country. From our continued teaching, she has developed the skills to do this, and the ICU team has the skills necessary to care for a patient like Mohammed. Dr Wejdan and Dr Fenton operating in Libya. Without our continued perseverance to travel to Libya, children like Mohammed and his brother Abdul would not survive. There would be no miraculous story to tell. And by the way, Abdul is now 6 years old and attending school! Recognizing that congenital heart disease requires lifelong care, Novick Cardiac Alliance continues to return to our partner sites multiple times per year over several years, because of children like Ahmed. Dr. Novick first met Ahmed in 2010, when he was 5 years old. 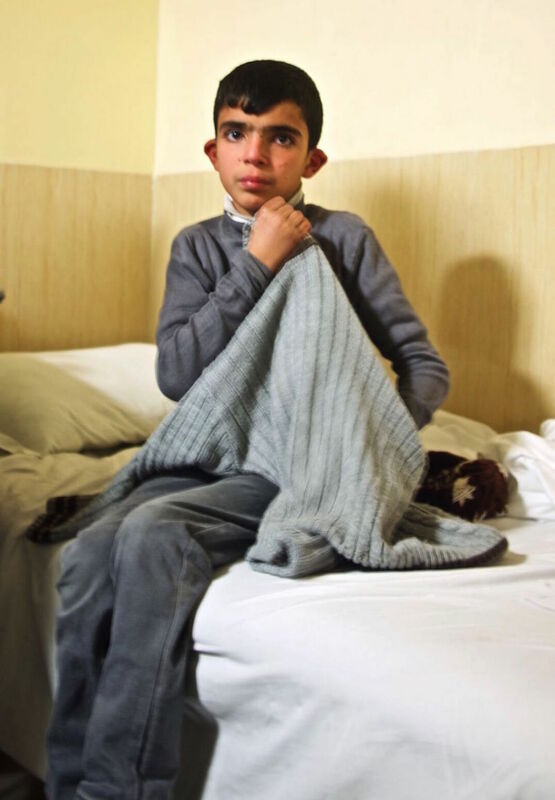 Ahmed was born in Nasiriyah, Iraq with a complex heart defect. Similar to most tragic truths in the developing world, there were no doctors in Iraq that could help their son. Ahmed’s parents felt hopeless watching their little boy constantly out of breath and not gaining weight like their four other healthy children. Then they learned that an American team was coming to the city of Sulaymaniyah in northern Iraq. Ahmed’s parents traveled over 10 hours by car in the hopes of finally giving their son a chance to receive the heart surgery he desperately needed. Dr. Novick performed Ahmed’s first surgery in August 2010 in Sulaymaniyah, alongside Iraqi surgeons. Ahmed recovered well after this surgery and was a healthy boy as he grew up in Nasiriyah. About a year ago, Ahmed began experiencing the same symptoms of heart failure, coughing a lot and often extremely tired. Now in 2015, there were Iraqi pediatric cardiac surgeons operating, but Ahmed’s condition was too complex for these novice Iraqi surgeons. Once again, Ahmed would have to wait for external aid. And once again, Dr. Novick came to the rescue. Ahmed received a second chance at a healthy life when Novick Cardiac Alliance operated on him in Karbala, Iraq in January 2017. 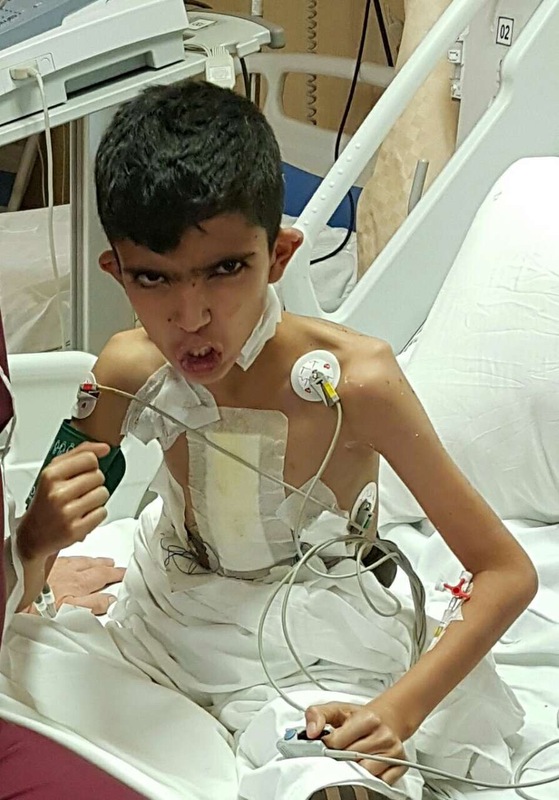 Ahmed was such a joyful boy to care for in the ICU. He was always in high spirits. His first time out of bed he danced and stomped around the ICU in pure joy to be alive. Every time we saw him on the ward, he wanted to tell us how well he was doing. Though we didn’t speak Arabic, we understood his fist in the air accompanied by a loud “roar” was his way of proving to us that his heart condition would not defeat him! Children with congenital heart defects like Ahmed require continued follow up visits with a cardiologist. When a child is born with a broken heart, they can develop symptoms in the future, even if they’ve had surgery. 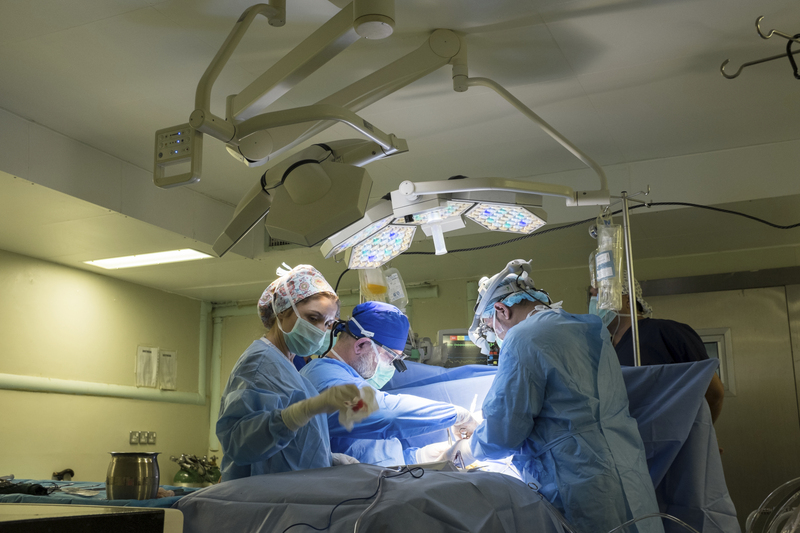 Some children will need to have more than one surgery in their lifetime. This is why Novick Cardiac Alliance aims to educate the local medical team so that they can provide the necessary care for children like Ahmed. You can help us to build sustainable health care solutions for children like Ahmed around the world. Meet Narjis, our first patient of 2017! Narjis was born in Baghdad, Iraq in October 2016. When she was about two weeks old, her parents Akar and Nor Maseer noticed she was breathing fast. They took her to the doctor and an echocardiogram showed she had two holes in her heart, an atrial septal defect and ventricular septal defect. The doctor gave her medicines and told the family to return in 1 week. After this week, Narjis did not improve and the doctor said she needed surgery. Unfortunately, there is no hospital or heart surgeon available for babies in Iraq, so doctors advised Narjis’ parents to take her outside Iraq. Advocating for his daughter, Narjis’ father Akar found a new doctor in Baghdad, but this doctor said her lung pressures were too high and surgery would now be impossible. 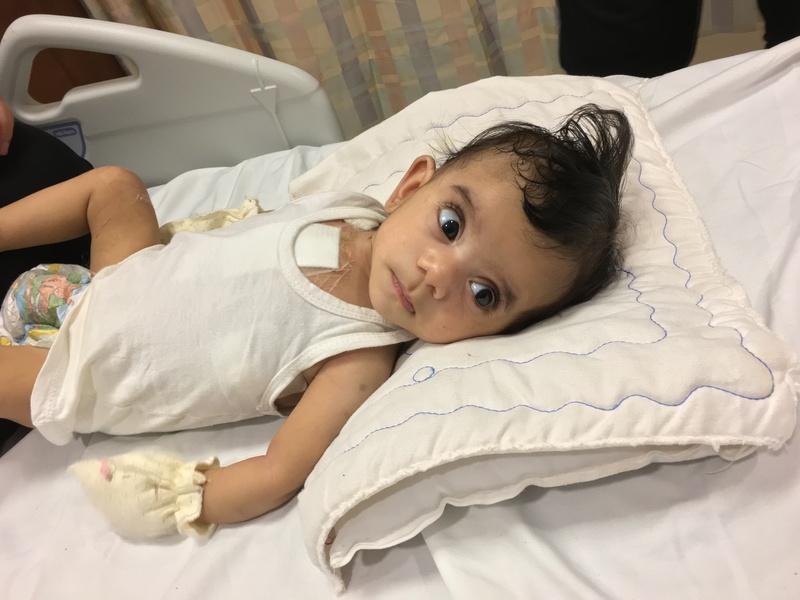 Not losing hope, Akar found yet another doctor for his daughter, but still the same answer: his family must travel outside of Iraq for her surgery, and if they didn’t she may not survive until her 1st birthday. At two months old, Narjis barely weighed as much as a newborn baby because of her heart defect. Still searching everywhere for a better solution, Narjis’ father saw an advertisement on Facebook from Al Kafeel Super Specialty Hospital in Karbala with the news that Dr Novick and his team would be coming to provide heart surgeries for children. Narjis’ parents packed their bags and drove to Karbala to meet our cardiologist on the first day of our arrival. Her heart surgery was scheduled for the next day. 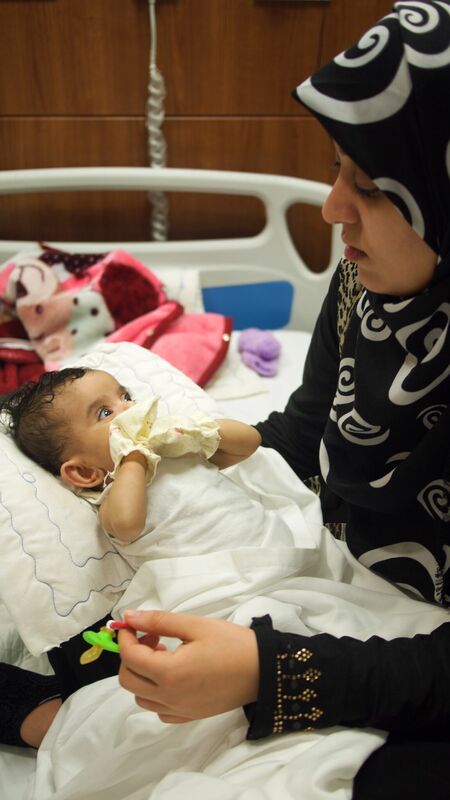 Now 3 months old, Narjis received her life-saving heart surgery to close those two large holes on January 16th. She recovered quickly and was back in her mother’s arms on the ward within two days. Narjis’s parents are very thankful that their sweet little daughter is healing and eating better. Just two weeks ago they were fearful they may lose their newborn baby, and now they see her future is bright. Hasen sits in his grandmother’s arms, bored and making a terrible fuss. “He was born with three holes in his heart.” His grandmother tells us what we’ve already seen on the ultrasound scan. She was tired, weary. The strain of life and her grandson’s heart problems are nearly too much to bear. Hasen was supposed to have surgery later that day, but not long after our visit, his surgery was cancelled. One of the most difficult parts of our work is assessing which children get surgery. 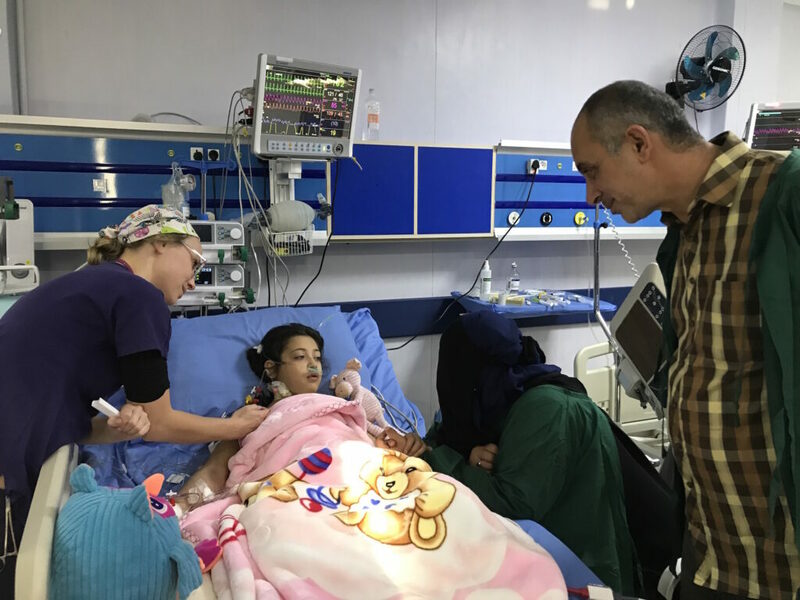 Together with the local surgical team, we decide that because of the complex nature of his heart defects and surgery needed to fix them, Hasen will need to be in recovery for much longer than we will be in Iraq. We can’t perform surgery and leave him without the proper acute care while he heals. Hasen is too sick to wait for our return in the new year. So a series of calls are made, and it is arranged that he will go to a neighbouring country to get surgery. It is the only option for Hasen, but comes with significant cost—physical, emotional, and financial. Hasen’s father is a day labourer. He gets occasional construction work, but hasn’t had anything steady for a long time. When he leaves the country with his son to get treatment, his family will be without any income at all. Sweet Hasen reminds us again why we work the way we do. Providing heart surgeries for children simply isn’t enough—equipping the local community to care for the health needs of their children is essential. So children like Hasen can get care in their own country, near their families and support systems. Life now, sustainability in the future—this is the kind of long-term change you bring every time you donate. That’s what drove Yaqin’s family from Mosul. It was 2014 and the early days of ISIS in the city. Life was beginning to get difficult—the rules for living changed, tightened, but it was still manageable, except for the fact that paid work became scarce. Yaqin’s father couldn’t support his family, so they made the decision to leave. It was a decision that saved his daughter’s life. We are clustered around Yaqin’s bed in the ward as her mother shares their story. Yaqin hasn’t cracked a smile once since we met her, but she is relaxed in the bed, shooting imaginary enemies on her mother’s phone. Every time we try to peek at the screen to see how she’s doing in the game, she slowly angles the phone so we can’t see it. She had heart surgery just two days before and her feisty attitude shows us she is clearly feeling well! When her family left Mosul, they first headed to a displacement camp outside the city. Their stay was cut short though—the camp was bombed, which meant they were quickly forced to move again to find a safer place to live. They traveled the full length of the country from Mosul in the north to Basra, at the southern tip of Iraq. The trauma of the last two years has taken a heavy toll on Yaqin. Between leaving Mosul, getting bombed out of a camp, establishing a new life in a southern city, all on top of being born with a serious heart defect—it was all too much. She lost all interest in eating. By the time we were able to assess her, Yaqin was extremely thin, had advanced symptoms of malnutrition, and needed medical care if she was going to survive. If Yaqin’s family hadn’t left when they did, they would have been trapped in Mosul—hemmed in when ISIS enforced border control. If Yaqin’s family had remained in Mosul, she would not have received the lifesaving heart surgery she needed to survive. The UN estimates there are 10 million people in Iraq who currently need assistance because of the ongoing war with ISIS. There are millions of displaced families who need the very basics to survive. Little girls like Yaqin, with complicated health needs, get squeezed out. But together we made sure she got surgery. Her heart is mended now. 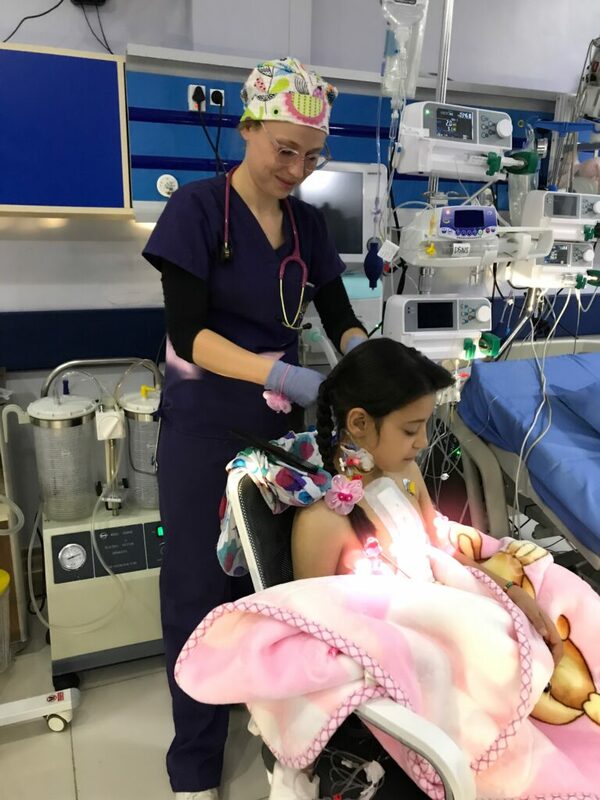 Yaqin spent her recovery time before being discharged having uninterrupted time with her mother–a rare treat for a girl with a little brother. She was eager to get home to enjoy her family—another simple, everyday miracle for a girl who escaped death twice.